Hillsong, a Pentecostal powerhouse with church campuses spanning the globe, recently descended on New York City's Times Square to declare the name of Jesus before thousands of onlookers while also shooting cover art for a new album that shares its name with the megachurch's 2014 conference theme. 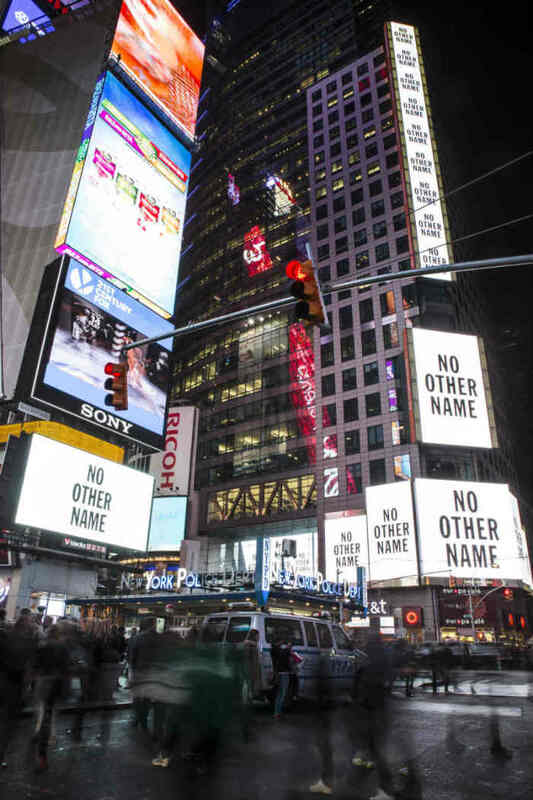 Instead of flashing the usual ads, news reports or the day's market results, 21 digital screens played for an hour a looped video comprised of just a few frames flashing repeatedly: "Jesus" and "No Other Name." 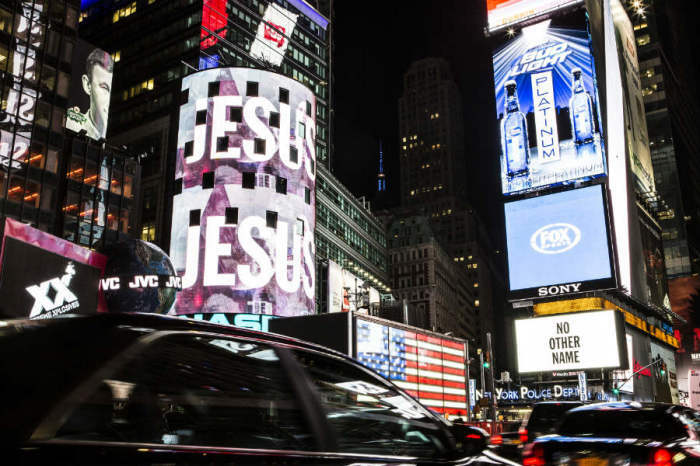 Jay Argaet, Hillsong's Art and Communications director, told The Christian Post that at least 400 people from Hillsong NYC church joined in the nighttime campaign at Times Square, one of the world's most sought out tourist destinations. Times Square, located between 7th Avenue and Broadway from 42nd and 47th Streets, is trafficked by an average of 360,000 pedestrians every day, many of them out-of-towners. Calling it a moment he will never forget, Argaet shares in a blog post that he was impressed to see passersby grow curious over seeing "Jesus ... No Other Name" light up the night sky. "Most interesting of all, were the murmurs from onlookers, as they talked among themselves, trying to work out what 'company' was being promoted and why there was no 'brand' or 'logo' attached to the 'ad.' Connecting the different frames from the video and realizing that the phrase 'No Other Name' was referring to the name of Jesus," writes Argaet. "Times Square — one of the most iconic locations on earth — is a place where so many names scream for fame," Argaet reflects earlier in his post. "The most powerful brands, biggest shows and famous celebrities ... every name wants to be the greatest! Perhaps this would be the most powerful way to remind the world HIS name trumps them all." The "No Other Name" event kicked off at 9:15 p.m. on April 24 and served as a cover shoot for Hillsong Live's new album of the same name, set for a worldwide July 1 release. According to Argaet, the campaign cost "only a few thousand dollars" and was "just within the album artwork budget." Hillsong Live features members of the church's worship team from around the world. Hillsong's previous release was "Glorious Ruins" in 2013, which peaked at no. 2 on Billboard's' Top Christian Albums chart. Hillsong Church's annual conference, scheduled for Sydney, London and New York City, also carries "No Other Name" as its theme for 2014. While the conference website references Colossians 1:15-20 about Christ's supremacy, the phrase "no other name" is referenced in Acts 4:12 — "Salvation is found in no one else, for there is no other name under heaven given to mankind by which we must be saved," while Philippians 2:9 comments on Jesus having a name "that is above every name." Hillsong Church was founded in 1983 by Pastors Brian and Bobbie Houston and welcomes about 30,000 worshipers every weekend at 11 campuses scattered around the world, with its 12th congregation launching May 11 in Los Angeles. In Australia, Hillsong has six campuses and twice as many extension services. The megachurch is affiliated with the Australian Christian Churches (the Assemblies of God in Australia) and remains influential through its award-winning music ministry.